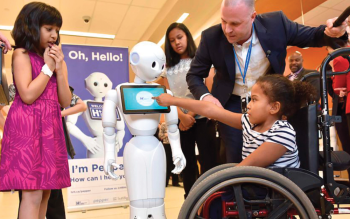 Toronto’s Humber River Hospital has partnered with SoftBank Robotics America (SBRA) to launch a new pilot program with Pepper the humanoid robot. This marks the first time a Canadian hospital has recruited a humanoid robot. Pepper is a 4-foot (1.2-metre) tall humanoid robot featuring large expressive eyes and lifelike movements and gestures, as well as a touch screen tablet to help users interact. Pepper has been placed in Humber River Hospital’s main entrance hall to greet, guide and engage with patients and visitors. To help with this, Humber River’s Pepper will have dedicated features built specifically for her. With her interactive touch-screen display, visitors will be able to search for their loved ones, washrooms, exits and more. The robot will also answer commonly asked questions and can even dance, play games and take selfies with passersby. You may not know but our local Emery Village BIA and its Emery Charities graciously donated $100,000 to the Humber River Hospital to sponsor a family dining facility on the children’s floor. The kitchen allows families to bring their own meals into the hospital and cook for themselves rather than purchasing more expensive food from the commissary and creating a home like dining experience for the entire family.